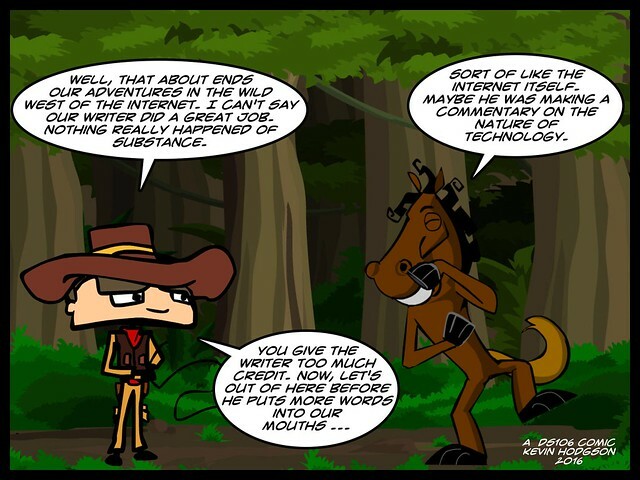 This post wraps up The Wild West Adventures of the Internet Kid, a daily webcomic that I started in January as part of the #Ds106 offshoot known as #Western106 and 40-plus comics later, I am bringing the adventures to an end (for now). I decided to make this FlipBook of all of the comics in the series, and you can find the collection at The Kid’s tumblr site, too. Thanks for reading. I hope it made you smile here and there, and maybe got you to think about genres and stereotypes (of Westerns and of Technology), now and then. I had a blast writing them. See you on the open trails! PS — Wondering how I made the Internet Kid flipbook? I created a Keynote slideshow (powerpoint or slides would work), imported all of the comic images, and then saved the whole thing as a PDF. That allowed me to use the Fliphtml5 site (which requires PDF uploads) to convert it into the flippable book. Easy. But I like how all of the comics look like they are in a book format. This entry was posted in comics, ds106, Internet Kid Comic. Bookmark the permalink. I missed these so enjoying them now in full screen flip format. Wonderful! You are prolifically creative and reflective. I’m thinking about how I can use your comics in some of my classes. Not sure how you find the time – must be a parallel universe or something. Thank you! I really appreciate your generosity. I enjoyed reading these and think it could be a fun and creative learning activity for kids. Hope others find and see this, too.